A SPANISH Audio CD to go with the SPANISH Bible Map tracts. One weekend during the summer of 1969, thousands of teenagers gathered near Dallas, Texas for a national music concert. During this same weekend we visited teenagers in a local jail. They were there for shop lifting, running away from home, drugs and other crimes. The jailers told us there was a 15 year old "very shy" girl who would not talk to them, but who did want help. She'd been hitchhiking all over the U.S. since 13 years old. We visited with her then briefly explained the enclosed Bible Map chart and then took her through the quiz questions and Scriptures on the back of the Bible Map. She gladly responded to these questions and Scriptures and trusted Christ as her personal Savior. This "shy" girl became excited and said, "This is what teen-agers are looking for. They're looking for an answer to life. This is what I've been looking for. This is the answer!" Millions of people world-wide also wonder, "Why do I exist? Why am I a living, breathing human being?" 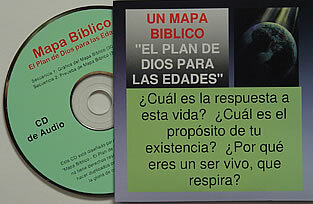 As you hear this SPANISH CD and follow the enclosed Bible Map-God's Plan of the Ages" chart and quiz, you may also want to help others hear and see this "answer for life and existence." One of the folded 4-color printed SPANISH Bible Map tracts will be enclosed with each of the SPANISH CD's produced by us. The SPANISH translator and speaker on the CD is Cesar Andres Jara. This CD is not copyrighted. You may make copies on CD's or cassettes FREE for the glory of our Lord Jesus Christ. Track 1 of the Audio CD takes listeners through the "Bible Map" CHART explaining God's Plan of the Ages (30 minutes). Track 2 takes listeners through the QUIZ questions and Scriptures on the back of the Bible Map tract (27 minutes). It clearly explains God's Plan of Salvation BY GRACE through FAITH in the Lord Jesus Christ. The goal is to help people know the answer to their life and existence. It is to help them KNOW they have established a personal relationship with the Lord and that they are guaranteed eternity in heaven with the Lord… with PROOF. That PROOF is presented with clear promises in the Bible, God's Word, and as shown with Scriptures on the Bible Map tract and audio CD. These "SPANISH Bible Map Audio CD and printed SPANISH Bible Map Tract Combo Packages"
are available in quantities for Bible Classes, Witnessing and Soul-Winning.